The term Big Bang was originally coined by the English astronomer Fred Hoyle in an attempt to help listeners to a radio program that he was a guest on understand the difference between it and the popular Steady State theory of which he was a proponent. The Steady State theory had been around since 1920 and proposes that matter in the Universe was being continually created, and had existed pretty much as it does today for all time. In 1931, the Belgian physicist Georges Lemaître first suggested the evidence for the expansion of the Universe, if projected back in time, meant that all the mass of the Universe was at some point concentrated into a single “Primeval Atom”. Einstein initially refused to accept the concept, telling Lemaître that “Your math is correct, but your physics is abominable.” It would take Einstein another four years to embrace the theory. Simply put, The Big Bang theory states that because space is expanding, the Universe must have been much denser in the past. Einstein’s theory of gravity lets us run time backwards to calculate the density of the Universe billions of years ago. As a result we know that the observable Universe must have expanded from an extremely dense and hot state about 13.7 billion years ago. During the Big Bang, matter did not explode into space from a point. 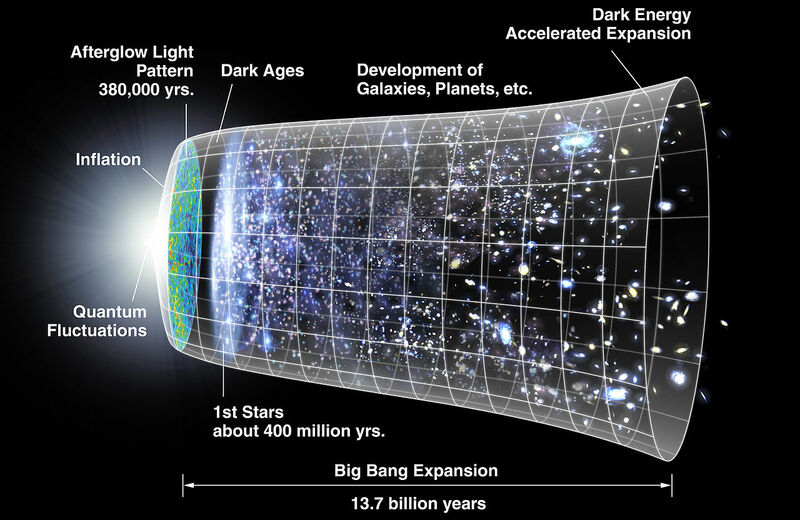 The Big Bang was an expansion of space itself that filled all of space with energy right from the beginning. Evidence indicates only that the early universe was extremely dense, but not necessarily extremely small. Even though the observable portion of the Universe was once packed into an incredibly small volume, it was not surrounded by empty space—it was surrounded by more matter and energy which is now beyond the observable Universe. This leads to an amazing little-known conclusion: if the whole Universe is infinitely large, then it was always infinitely large, even during the Big Bang. Current evidence also tells us that the Universe is either infinitely large, or else is so large that we cannot detect its curvature from what we can observe—similar to how we can not tell that the Earth is round by looking at our back yard. 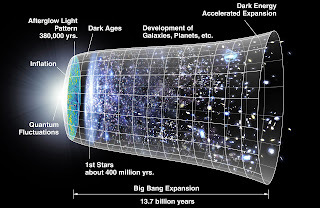 The observational evidence for the Big Bang is overwhelming and is known as the Four Pillars of Big Bang Cosmology: Hubble expansion as measured through the redshifts of distant galaxies, the discovery in 1965 of cosmic microwave background radiation, the abundance of hydrogen and helium in proportions predicted to have been produced during the Big Bang, and the formation of galaxies and large-scale structure such as galactic superclusters. 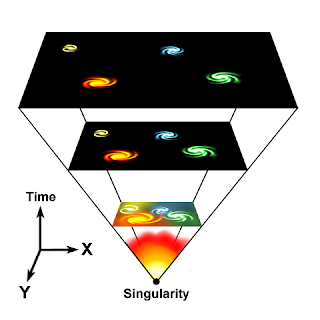 But the Big Bang is not the whole story—its details are a subject of intense research. The Big Bang theory says nothing about how the universe came into being in the first place—it just assumes that energy, space and time already existed. And because current description of physical laws do not yet apply to such extremes of nature, we may never know what actually happened during the Big Bang.